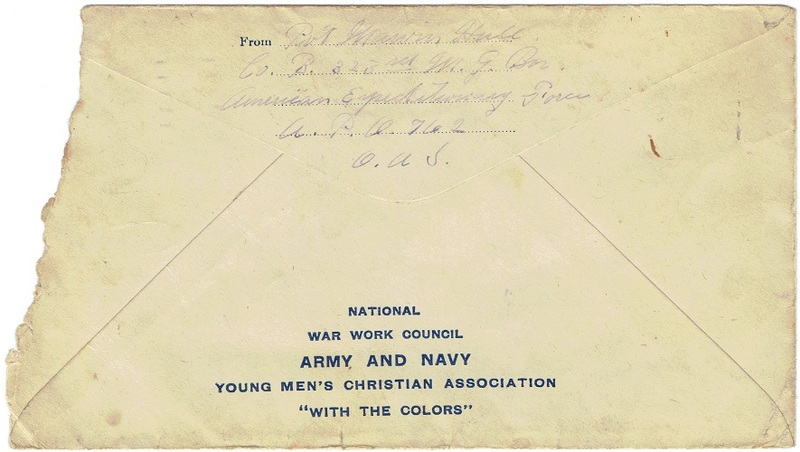 Co. B - 323rd Machine Gun Battalion "World War One Envelope"
This is an original censored WWI AEF Envelope dated September 2, 1918 and franked with stamp "Soldiers Mail". The envelope was sent by Pvt. 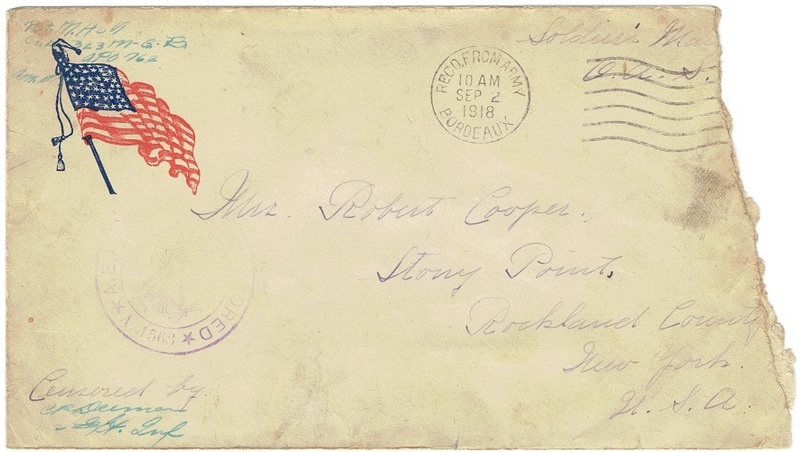 M. Hall to Mrs. Robert Cooper, Stony Point, Rockland County, New York. The address it was sent from was somewhere in France on this date. MARVIN HALL was born on November 21, 1895 in Sloatsburg, Rockland County, New York. to Rachel Ida Sisco (1852-1905) and Martin Hall (1858-1944). He was the sixth child of seven. His mother died in 1905 and Marvin was raised by his sister Grace, who was married at the age of 16, and her husband Robert S. Cooper. Marvin Hall (#374396) was drafted in July 1918 as a part of the Replacement Draft. The automatic replacement drafts, devised by the War Department, were intended to furnish each month the equivalent of the estimated casualties for the following month. After receiving barely two weeks of training the July Draft members were sent overseas to be assigned where needed. The need for replacements on the front was too high to give new draftees adequate training. Marvin Hall was send overseas with the 12th Company of the July Automatic Replacement Draft out of Camp Hancock, Georgia on July 30, 1918. Once in France Pvt. Hall was assigned to the 323nd Machine Gun Battalion, as evidenced by the address on the envelope. Most likely he was placed here to receive much needed further training, considering the 83rd Division's status as a Depot Division. At un unknown time after September 2, 1918 Marvin Hall was transferred to the 102th Infantry Regiment, 26th Infantry Division. This unit had been on the offensive since February 1918 and was involved in St. Mihiel (early September) and Meuse-Argonne Offensive (late September 1918). It is possible that Pvt. Hall was a replacement for casualties suffered during one of these campaigns. Marvin Hall remained with the 102th Infantry for the remainder of his time in France and sailed home with them on January 11, 1919 arriving back in the US ten days later on January 21. In 1921, he married Aurelia Julia Halaschey (1897-1950) who was born on May 10, 1897 in Hungary. They had two children during their marriage, one daughter, Madelyn R. (Hall) Bulson (1922-2013), their son John M. was born in 1927 and passed away that same day.